Transparency Market Research’s new report titled “Styrenic Block Copolymers Market - Global Industry Analysis, Size, Share, Growth And Forecast 2012 - 2018” discusses the revenue and demand for styrenic block copolymers at a global level. 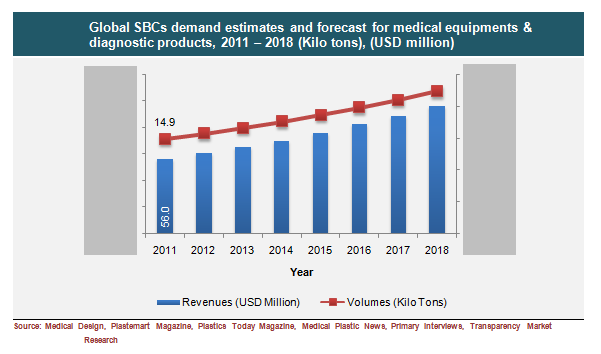 The report states that the global demand for SBC in the medical and healthcare applications stood at 123.4 kilo tons in 2011. Growing at a CAGR of 5.4% in the forecast period 2012 – 2018. By 2018, the market is expected to reach 177.1 kilo tons. In terms of revenue the market is expected to reach US$698.8 million by 2018, growing at a CAGR of 7.2% from 2012 to 2018. Styrenic block copolymers commonly known as SBCs consume the largest-volume market within the thermoplastic elastomers (TPE) family. Styrenic block copolymers are illustrated by their physical and mechanical properties and ability to be processed as thermoplastic materials of filled vulcanized elastomers. The demand for styrenic block copolymers in the medical and healthcare industry is primarily high owing to high health and environmental issues related to its usage. Hence, the shift in trend to replace PVC products with environment-friendly compounds has boosted the growth and demand for styrenic block copolymers in the medical and healthcare applications. Also, increasing research and development in bio-based SBC plastics market is likely to herald the most promising growth opportunity in the market. The only critical challenge this market faces is the volatility in raw material prices. Hence, the shift in trend towards the constant use of bio-based alternatives for synthetic materials is in the wake to minimize the effect of constant fluctuation. This report analyzes the styrenic block copolymers market in terms of volume and revenues to provide a comprehensive picture of SBC demand in the medical and healthcare industry. The global demand for Styrenic block copolymers (SBCs) in the diagnostic and medical equipment and products market is estimated to grow at a CAGR of 6% from 2012 to 2018. However, in terms of revenue, the SBC market is expected to reach US$95.9 million by 2018. The study report also provides in-depth details of the SBC market by segmenting the market into styrene butadiene styrene (SBS), styrene ethylene butylene styrene (SEBS), and other SBCs (including SIBS). Among these, SEBS is highly consumed by the medical and healthcare industry and proves to be the most dominant SBC product in the global market. It is also the fastest growing type of SBC in the medical sector. It accounted for over 68% of total medical SBC volumes in 2011. SEBS is mainly used for manufacturing medical bags (including CAPD, IV, and blood bags) and many other medical flexible materials within the medical and healthcare industry. Through regional research and analysis, the report states North America as the leading consumer for medical styrenic block copolymers (SBCs). Growth in this region is due to the increasing medical expenditure by the U.S. federal government. SBC in North America accounted for 38.7% of the global demand in 2011. This region was subsequently followed by Europe as the second-largest consumer. Asia Pacific is the next fastest growing market for SBCs as it is expected to grow at a CAGR of 7.2% from 2012 to 2018.